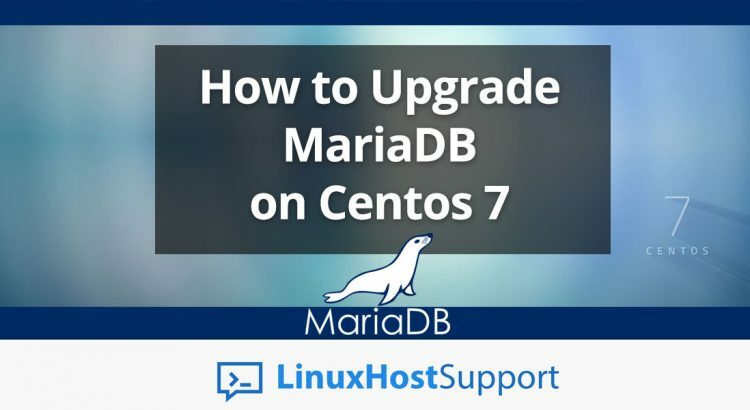 In this tutorial we are going to provide you with step-by-step instructions on how to upgrade MariaDB on a CentOS 7 VPS. MariaDB is an open source, community-developed fork of the MySQL relational database management system. MariaDB is highly compatible with MySQL, ensuring exact matching with MySQL commands and APIs. The upgrade process should take about 10 minutes if you follow the easy steps described below. There is no MariaDB root user password set by default. Use the following command to set a new MariaDB root user password, remove the anonymous users, secure MariaDB by restricting the remote login for root user and remove the test database. That is it. MariaDB has been successfully installed on your server. If you use one of our Linux Host Support services, you can simply ask our expert Linux admins to upgrade MariaDB on your CentOS 7 server for you. They are available 24×7 and will take care of your request immediately. This is so nice blog.You explain how to upgrade mariadb is very well. This information is so helpful for all students. Thanks for sharing with us!!!! nice! Worked seamlessly on my development DB and then my Prod DB. The only thing I changed was the line in the repo point to “baseurl = http://yum.mariadb.org/10.2/centos7-amd64“. I changed it to reflect 10.3 ( Latest at this time ). Mariadb came right up no problems.